The man affectionately known as ‘Mr Alloy Wire’ has been named as one of the most influential manufacturing personalities in the UK by a leading trade publication. 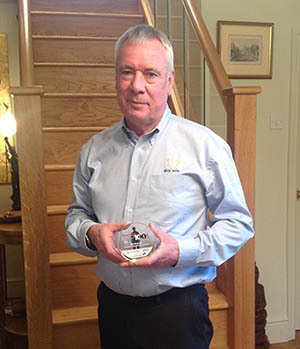 Chairman Bill Graham, who has been involved with the company since 1972, was announced in The Manufacturer’s Top 100 at a recent event in Birmingham. The high-profile list – sponsored by Autodesk, BDO and Lloyds Bank – recognises individuals who have made a major contribution to UK industry through innovation, skills development and helping to grow supply chain business. Judges praised the former apprentice for his ability to steer Alloy Wire into one of the UK’s most progressive SME manufacturers, exporting to more than 45 countries across the world. They also singled out his determination to create an employee-owned company, where every member of staff owns part of the business. This has resulted in a ‘unique and vibrant’ working environment where absenteeism is close to zero and monthly bonuses are paid equally to all employees. Bill commented: ‘You never expect to be recognised for doing something you love, but to make it on such a prestigious list is a major honour for everyone associated with the company. Under Bill’s leadership, the firm has grown to $14m of annual sales, supplying high quality drawn round wire, flat wire and shaped wire to customers working in aerospace, oil and gas, nuclear, automotive and rail. As part of his recognition, the company will work hard to promote UK manufacturing and continue its efforts to encourage young people into industry. The Scottish entrepreneur was joined in the Top 100 by some illustrious names, including Andrew Denford (Founder of F1 Schools), Christopher Nieper (MD of David Nieper) and Edward Naylor (CEO of Naylor Industries). Our Winter 2018 newsletter is now available for download. Read about our record year, increased exports and the power of people in our latest newsletter.